A working model to demonstrate the principles involved in the action of a force-pump. Cylinder is 25 x 350 mm dia x overall height. It is provided with a non-return float valve at its lower end. Lower part of the cylinder has an outlet side tube communicating with the lower end of another cylinder also equipped with non-return valve. Outlet tube from the secondary cylinder is drawn out into a jet to demonstrate ability of force pump to eject water at high pressure. We are leading manufacturers, suppliers & exporters of Force Pump for Physics Lab. Contact us to get high quality designed Force Pump for Physics Lab for schools, colleges, universities, research labs, laboratories and various industries. We accept bulk orders for government tenders in all countries around the globe. 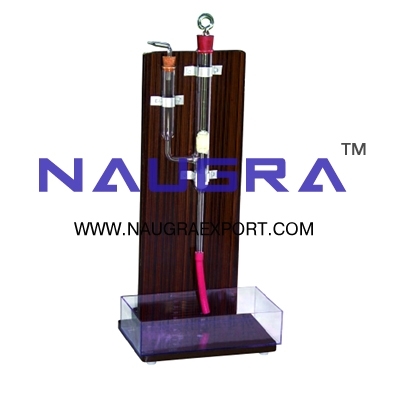 For similar products visit at main page of Fluid Mechanics Physics Equipments.